In many large engineering design problems, it is not computationally feasible or realistic to store Jacobians or Hessians explicitly. Matrix-free implementations of standard optimization methods—implementations that do not explicitly form Jacobians and Hessians, and possibly use quasi-Newton approximations—circumvent those restrictions, but such implementations are virtually non-existent. We develop a matrix-free augmented-Lagrangian algorithm for nonconvex problems with both equality and inequality constraints. Our implementation is developed in the Python language, is available as an open-source package, and allows for approximating Hessian and Jacobian information.We show that our approach solves problems from the CUTEr and COPS test sets in a comparable number of iterations to state-of-the-art solvers. 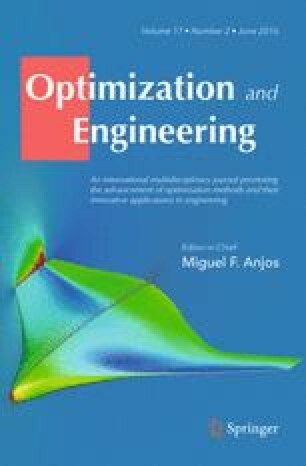 We report numerical results on a structural design problem that is typical in aircraft wing design optimization. The matrix-free approach makes solving problems with thousands of design variables and constraints tractable, even when function and gradient evaluations are costly. We would like to thank Graeme J. Kennedy for his assistance in setting up the structural design problem shown in this work. The computations for that problem were performed on the General Purpose Cluster supercomputer at the SciNet HPC Consortium.